Eggs Ala Round is the 1st design introduced in the Ala Round Collection, which also includes Ornaments Ala Round and Snowmen Ala Round. 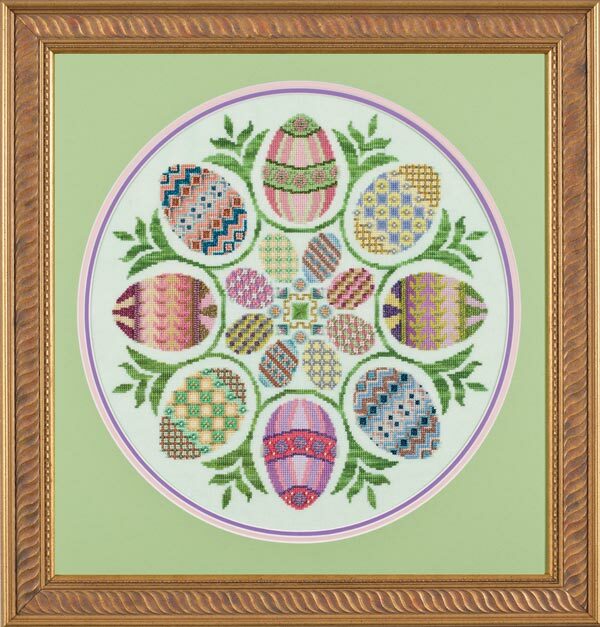 The inspiration to design Eggs Ala Round came from hand-painted eggs seen on display at the Brick City Cross Stitch shop in Ocala, FL. These absolutely stunning creations were hand painted by Jeannie (who works in the shop), based upon the ancestral custom of egg painting, known as Pysanka. Considered Ukrainian in origin, Pysanka spread throughout the region of The Ukraine and Romania as an Easter tradition within the Orthodox Catholic Church. This fine art of egg painting was passed down from generation to generation. The process involves emptying the egg of its contents, covering it with a thin layer of beeswax, and then using a special tool called a “kistka” or stylus to lightly carve the motifs into the egg. The egg goes through numerous dye dips, wax carvings, and additional wax dips to arrive at the finished product. I’m not sure how and where Jeannie learned how to do this, but her artistic talent is amazing and the minute detail on these eggs was absolutely breathtaking! One region of Romania that is most famous for the art of egg painting is Bucovina. In the early days of this folk art craft, the primary color of these eggs were red — symbolizing the death and resurrection of Christ at Easter. However, over time, other colors were introduced and the whole concept of egg painting spread around the world. Even today, Romanians believe that painted eggs bring luck and protect their homes against demons and unholy spirits. In some areas of Romania/The Ukraine, newlyweds keep painted eggs in their residences as charms to protect their home, bring balance in their lifes and secure a happy marriage. Unlike the traditionally bright colors of the Pysanka eggs, I took some creative license and stayed more within a pastel palette of colors. Fabric: Stitched on 28 count Chrysalis (New Color for 2011) Cashel Linen by Picture This Plus. Purchasing a fat 1/4 will work sufficiently, but only allow 2 1/2″ of selvage on the left and right sides. The model was stitched using a fat quarter. Fibers and Embellishments: 45 colors of Sullivans floss, 11 colors of Mill Hill Beads, 9 colors of Kreinik #4 Very Fine Braid, and 1 color of The Gentle Art. Comparable colors provided for Anchor and DMC floss.